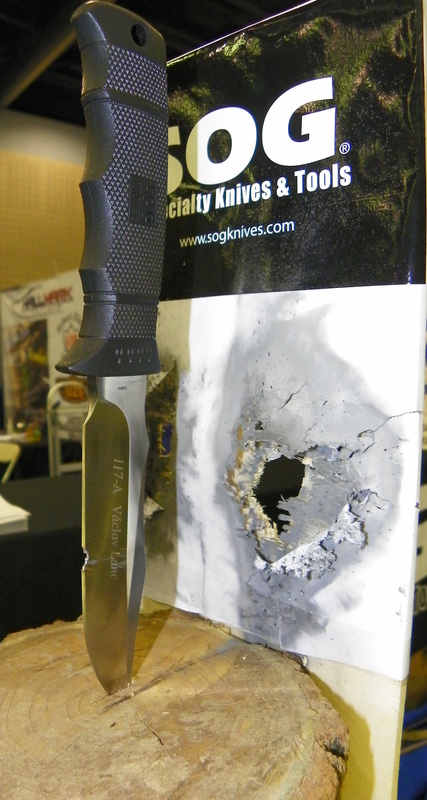 Just a few weeks ago we attended the 30th Anniversary Blade Show and Tactical Gear Expo here in Atlanta. 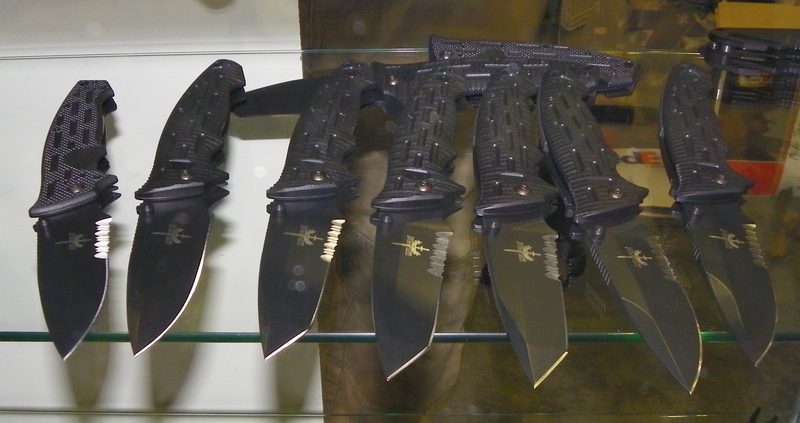 For three full days collectors and knife aficionados filled the Cobb Galleria Convention Center enjoying over 900 exhibitors as well as informative seminars on varied subjects. There was something for everyone including the debut of the Tactical Gear Expo where all things tactical was the focus. 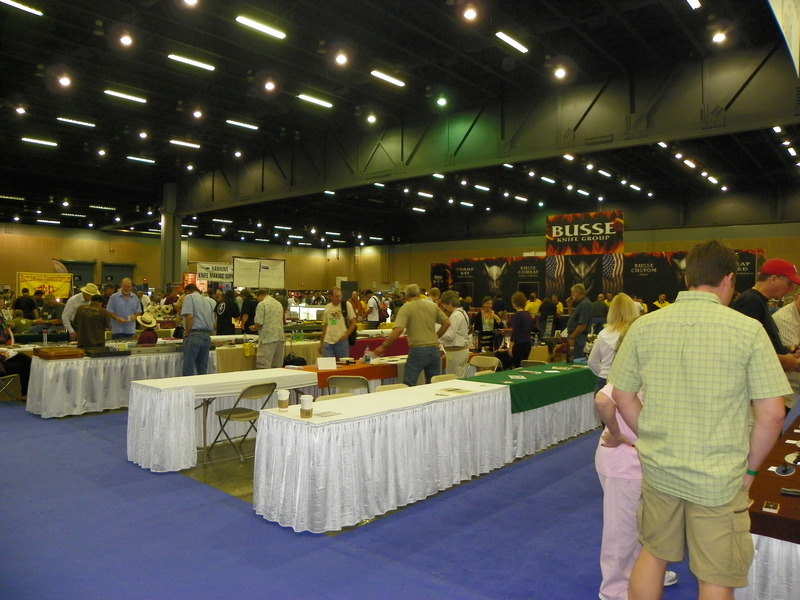 Rows and rows of booths divided the show into sections from knife making materials and custom knife makers to the antique collectors and major manufacturers. There was a great mixture of seminars. You could learn how to throw a knife and tomahawk and just one hour later discover authentic renaissance swords and fencing. Knife makers were not left out with classes on forging knives, texturing knife handles and more. We attended to check out the new innovations for 2011. First stop of the show was the Mil-Tac booth. One of my favorite knives is a MTF-2. This line from Mil-Tac represents 18 years of honing skills in the tactical knife industry. I do not know if it is the rigid frame and locking bar or the extra thick blade that make this a preferred knife of mine. The MTF-2 is perfect for self-defense and I usually don’t leave home without it in my pocket. Mil-Tac had a little of everything at their booth. Representing this fine company the display cases were filled with fixed blade knives, 1911 grips, knife sheaths and other tactical gear including their tactical defense pen. We could have spent hours at the booth, but the Spyderco booth was calling…. Amy was drawn to their Ladybug3 Tatoo model. New for 2011 this “cute” – yes – “cute” knife is small but cuts well and is easy to open. 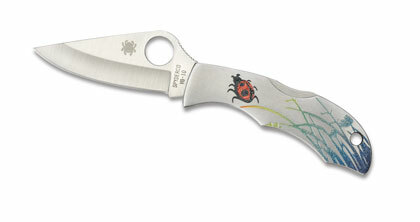 The stainless steel handle is etched with a multi-color scene of a red ladybug among colorful grasses. This knife has found a new home in Amy’s purse. Spyderco’s knives appeal to everyone and part of their new updates for this year include several blades two-inches or under to comply with new pocketknife laws here in America. From the short to the long we discovered the Ed Schempp Rock which is slightly longer than six inches and is a tough big blade to handle outdoor chores. Finally, we were impressed with the Chaparral – a new mid-sized folder that may be Spyderco’s thinnest, lightest mid-sized CLIPIT yet. Complete with a carbon-fiber handle, the knife has a mid-position back lock and screw-together construction. For every need you may have – you can’t go wrong with a Spyderco. Not to be missed was the always impressive SOG Specialty Knives and Tools. You could not miss the Limited Edition Gunny Series knives co-designed by R. Lee Ermey, aka “The Gunny.” We first met “The Gunny” at the 2010 SHOT Show in Las Vegas. His “Gunny Approved” knives are crafted using cocobolo hardwood handles with stingray hide inlay and nickel-plated commemorative coins. The stainless-steel blades come with leather sheaths. Coming in August SOG will be releasing the Aegis Mini. For around $80 you will get a premier folder with their trademark bayonet reversible clip and built-in safety. SOG claims the Flash Rescue is “one of the coolest knives they’ve ever seen” and we agree. This maybe one of the most discreet carry knives I’ve ever seen. You can keep up with all their latest news and releases at their website and blog. The last major stop before checking out the hundreds of other booths was Benchmade. As I stated earlier I have two pocket carry knives in rotation at the moment – one is a Mil-Tac and the other – a Benchmade. After free knife sharpening we watched as show attendees lined up for laser engraving by Benchmade. The lasermark service also you to customize any Benchmade knife. Vast arrays of Benchmade’s finest were on display but perhaps the stars of the show were the 581 Barrage, 915 Triage and 470 Emissary. As leaders in quality and leading edge designs Benchmade is passionate about their products and stand behind them with a warranty that can’t be beat. These three knives debuting in 2011 do not disappoint. The 581 Barrage features a drop-point M390 blade, thumb stud and reversible tip-up pocket clip. 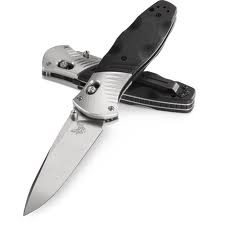 The new Barrage has the AXIS Assist locking mechanism patented by Benchmade. AXIS allows you to quickly, with ease, open the knife when you need it the most. The 915 Triage is a utility knife that includes a safety hook and glass breaker. Other features of the bright orange knife are a modified sheepsfoot N680 blade and ambidextrous thumb studs. Our final mention is the super lightweight 470 Emissary with a 3-inch clip-point blade and aluminum handle. The 30th Anniversary Blade show left a lasting impression. We left impressed, exhausted and excited. It was the ultimate show for selling, trading and buying. Lighting was great and the flow of the show eased congestion. I recommend you attend the 31st show next year. After just one visit we understand why the show is known as the world’s most important knife event. It was a sharp three days here in Atlanta. For more pictures, please see the Carducci Tactical Facebook page. For more information about Mil-Tac products check out their website and don’t forget to check out Spyderco and Benchmade. 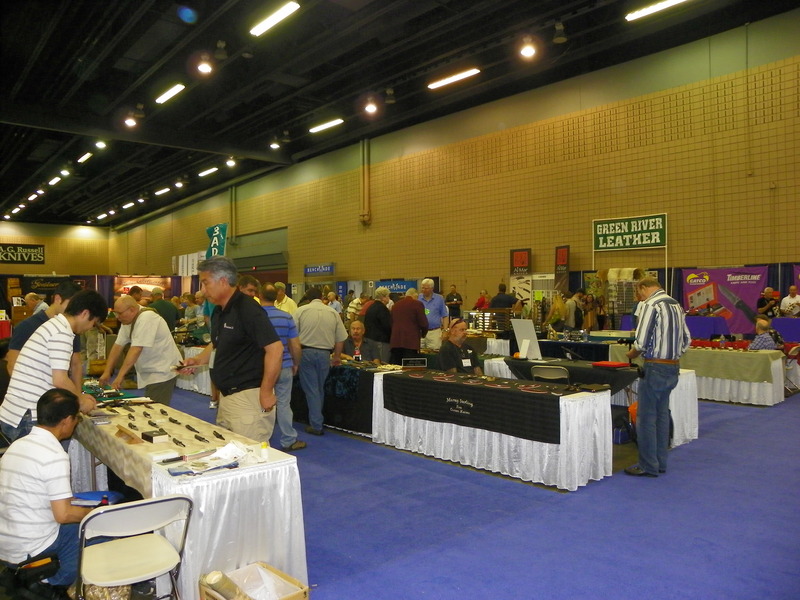 Further north is the S.H.A.R.P Show in Louisville, Kentucky. For 3 days October 21 – 23 the Fern Valley Inn will host the show. Another Spirit of Steel show and details can be found online. Earlier in September at the Seelback Hilton Hotel will be the 42nd Annual Knifemaker’s Guild Show. Save the date: September 16 – 18, 2012. The 2012 Knife Exposition by the American Bladesmith Society will be held at the Sheraton Gunter San Antonio from January 27th to 29th, 2012. You can mark your calendar for March 9th to 11th, 2012 for The Knife Roadshow: Dalton. Located in north Georgia near Chattanooga at the NW GA Trade Center there will be free road show style appraisals. When Carducci Tactical discovers more show information we will keep you updated. Check back on our main website www.carduccitactical.com for information.